"Easy weeknight recipe with plenty of room for variation: use chicken or fish, bok choi, tat soi, choy sum, mustard greens, or turnip greens. It's made with things I normally have on hand (greens, onions tomatoes, cheese, frozen protein, couscous or rice) and cooks up in a jiffy. Feels like a real treat!" Heat 2 teaspoons olive oil in a skillet over medium-high heat. Saute onions in hot oil until slightly softened, 3 to 5 minutes. Place chicken in skillet and season with garlic salt and black pepper. Cover the skillet with a lid and cook until chicken is browned on one side, 3 to 5 minutes. Turn chicken and season with garlic salt and black pepper on the other side. Transfer chicken and onions to a cutting board and chop chicken. Stir bok choy into the same skillet, reduce heat to low, cover the skillet with a lid, and cook until greens are slightly tender, about 1 1/2 minutes. Bring water to a boil in a saucepan; remove from heat. Stir couscous spice packet contents and 1 tablespoon olive oil into water; add couscous. Cover saucepan and let stand until water is absorbed completely, about 10 minutes. Fluff couscous with a fork. 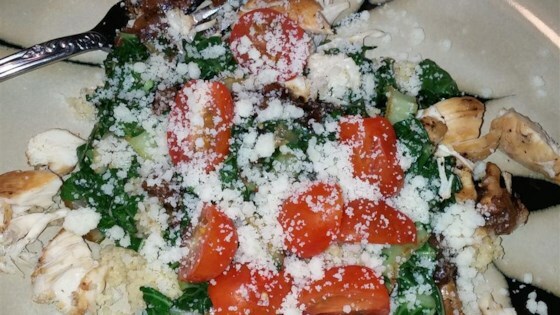 Spoon couscous onto plates, top with greens, onions, and chicken, respectively, and sprinkle tomatoes and Mizithra cheese over the top. Watch how to make simple, takeout-style crispy orange chicken. You can substitute tilapia filets for chicken, if desired. With fish I would avoid using cheese. You can use any flavor couscous (my favorite is toasted pine nut). Can use other Greek cheeses; Mizithra cheese is a hard, tart, sour cheese from Greece.